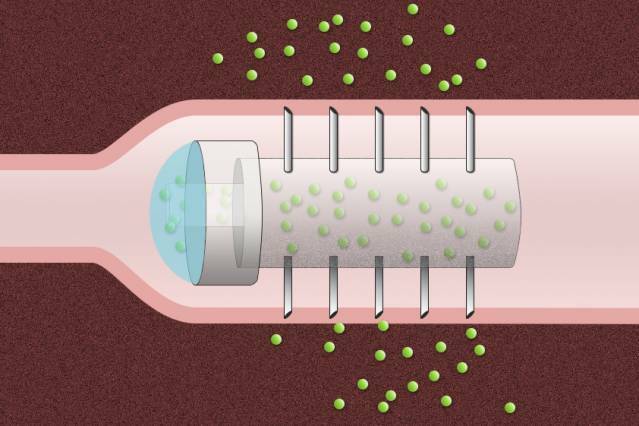 The researchers have devised a novel drug capsule coated with tiny needles that can inject drugs directly into the lining of the stomach after the capsule is swallowed. The team in Massachusetts believe the development could be a way to circumvent the need to have an infusion or subcutaneous administration of a drug and be very useful for delivering biopharmaceuticals such as antibodies, which are used to treat cancer and autoimmune disorders like arthritis and Crohn’s disease. This class of drugs, known as ‘biologics’, also attracted my attention a few days ago in a blog called The Zebrafish Solution. Schoellhammer and his colleagues set out to design a capsule that would serve as a platform for the delivery of a wide range of therapeutics, prevent degradation of the drugs, and inject the payload directly into the lining of the GI tract. Their prototype acrylic capsule, two centimeters long and one centimeter in diameter, includes a reservoir for the drug and is coated with hollow, stainless steel needles about five millimeters long. In animal studies, using pigs, the team found that the capsule delivered insulin more efficiently than injection under the skin, and there were no harmful side effects as the capsule passed through the digestive system. The tests on pigs showed that it took more than a week for the capsules to move through the entire digestive tract, and the researchers found no traces of tissue damage, supporting the potential safety of this novel approach. The team’s plans for the future include modifying the capsules so that peristalsis, or contractions of the digestive tract, would slowly squeeze the drug out of the capsule as it travels through the tract. They are also working on capsules with needles made of degradable polymers and sugar that would break off and become embedded in the gut lining, where they would slowly disintegrate and release the drug. We wish them good luck. So the needles wouldn’t scratch the tissue as it went along? How can there be no pain receptors in the GI tract? So where does the pain come from when you have food poisoning or gluten intolerance cramps?